Fancy some Greece in Batumi?! Bequeathing you with a little bit of Greece, the Colonnades depict the peculiar Greek architecture – tall, white, towering arcades that greet you en route the Seaside Boulevard. 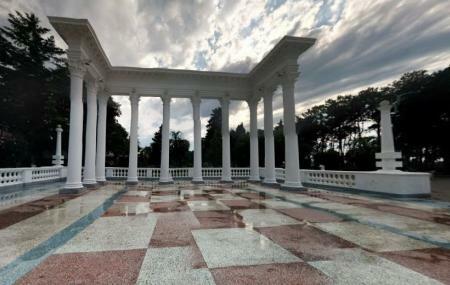 The height of the colonnades determines the significance of the then sea level of Batumi. The shore-line of Batumi now, lies at some 200 to 300 odd meters. Built about 80 years ago, this attraction hosts several cultural events in the summers. Amidst the white columns, is a statue of an aviator woman with a toy plane in a hand, as a yearning child tries to reach it! Here, you will come across some interesting people that may pose as ancient philosophers. While their knowledge maybe dubious, they certainly do make for great photo ops. People normally club together Europe Square and Alphabetic Tower while planning their visit to Colonnades.